Every now and again, when I’m walking down the street, a familiar song from childhood springs to mind. It was written and sung by Ziggy Marley and the Melody Makers (the children of Bob and Rita Marley) and preached two simple precepts to an infectious reggae beat: get along with each other and believe in yourselves. It was the theme to a Canadian-American children’s show called Arthur about the eponymous aardvark and his fellow anthropomorphs who lived in Elwood City, as they all tried to work together to make the world a better place through small acts of kindness. I watched it religiously over breakfast before going to school. If CBBC were showing Arthur in the morning, it was going to be a good day. I can’t remember what it was about the show which had me so obsessed. It may have simply been the opportunity to inhabit the world of Arthur Reed, so lovingly created over the years by Marc Brown. Every part of the city was a richly detailed and vibrantly coloured piece of eye-candy, beautifully capturing the essence of places which might otherwise seem mundane. Shots would often place you at eye level with the characters, so it was really like you were one of the gang, catching up over milkshakes at the Sugar Bowl, or sat in Mr Ratburn’s class having just been set a surprise quiz, staring wistfully into second grade’s classroom as they sang songs about ice-cream. Perhaps the allure was how relatable I found the main character: just like Arthur, I too was once a specky bookworm in primary education who had an annoying sibling, a strict piano teacher and an difficult relationship with the teething problems involved in getting older. What I remember most deeply about the show today is how the characters resolved their conflicts through a process of learning, taking responsibility and finding a solution or compromise through cooperation. When Binky was blamed for the graffiti ‘Binky Rules’ springing up all around the school, Buster and Fern, with clashing styles of sleuthing, first competed to prove their friend’s innocence and the intellectual dominance of their respective genders. Only when they joined forces, however, could they prove that it was actually a band of the same name (in reality, the Finnish folk group Värttinä) which was vandalising the city as a publicity stunt for their new CD. This theme of overcoming categories which inhibit cooperation by emphasising difference – including gender, age and class – was a central maxim of Arthur episodes, and one which is no less relevant today. When Arthur floored his younger sister D.W. for breaking his toy aeroplane (an iconic moment of children’s TV broadcasting which, 16 years later, would spawn the great ‘Arthur’s Fist’ meme), neither he nor his sister could understand what they did wrong and both refused to apologise to the other. Only after being hit himself by Binky, who was pressured to demonstrate an act of hooliganism to remain a member of the Tough Customers club, was Arthur able to empathise with his younger sister, who herself learnt that she was wrong to throw his plane out of the window thinking it was only a model. Finally able to understand each other, the characters all realised how they were wrong to resort to violence – forcing their will on the other – rather than cooperation and could then apologise authentically as a result of this revelation. Again, ignorance and social pressures are shown to prevent the individual from acting freely and meaningfully or accepting responsibility within their community. However, this theme of ‘working together to make things better’ (to quote Ziggy) never resulted in stories which were in any way formulaic or contrived. Often there was no great revelation neatly wrapping up the episode, but rather the bitter truth that many unfortunate facts about life cannot be changed and must simply be accepted over time. After the fire at the school on April 9th, Arthur became paranoid that his father’s life would be imperilled at every catering event he attended. His father’s parable of similar fears about his own mother’s safety which he had growing up offers some solace for Arthur, but the fact is that his father will always have to leave the home to operate outside the world Arthur can know or control. These slightly more serious episodes were not afraid to shy away from issues of dyslexia, asthma, cancer, diabetes, divorce and death. 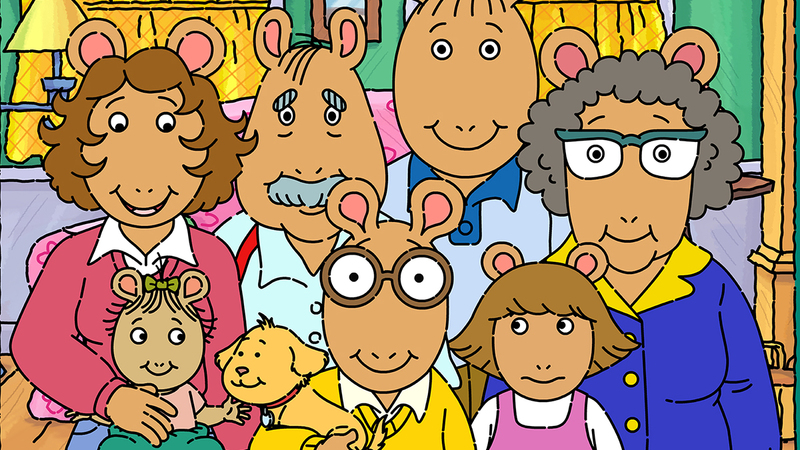 It was the depth and authenticity of the characters in their responses to such conflicts and issues which made it so appealing to me growing up, and to many children around the world, it seems, as Arthur, scheduled for another four seasons, has become the second longest-running animated series in the United States, after The Simpsons. Combined with smooth jazz transitional motifs and guest appearances from the likes of Simon and Garfunkel, Yo Yo Ma and Michelle Kwan, Arthur was (and is) a truly memorable show.